Garmin GPS 152H is a budget chartplotter offering the basic capabilities of a chartplotter. It has a 4-inch screen which is greyscale LCD. It includes compass and shows your speed and position. The system uses Wide Area Augmentation System (WAAS) making the device accurate to within 3 metres. There are no maps compatible with this system. You are limited to the basic functions of a chartplotter with this system. You can store 3,000 waypoints, 50 routes and 100000 track log points. You also have access to tide tables and sun and moon information. Garmin GPS 152H has been discontinued. For the latest range of handheld GPS systems click here. The GPS 152H is a budget chartplotter which offers a 4-inch diagonal, high contrast, greyscale LCD display. It has a high-sensitivity GPS receiver and internal GPS antenna. You can also connect an external GPS antenna using the BNC connector. The GPS 152H includes compass and displays speed and position and can track you route between waypoints. Tracking your position with the GPS152H is very accurate especially with the included Wide Area Augmentation System (WAAS). When this system is switched on it is accurate to within 3 metres. If you want a chartplotter that is more advanced than the budget 152H system then we recommend the Garmin GPSMAP 451. Unlike the 152H this system is touchscreen and accepts further mapping capabilities so you can get more information relating to your journey. You can store 3,000 waypoints, 50 routes and 100000 track log points. This 152H is also NMEA compatible which will send position data to another device. Also included is tide tables and sun and moon information. This device is also waterproof to IPX7 standards. Please refer to the Garmin GPS 152H manual found below. 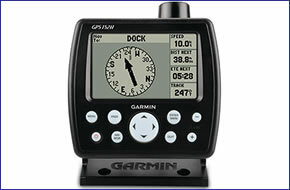 Question: Garmin 152..... how much £? Do you have a question about the Garmin GPS 152H? Submit your question via our contact page.